The AstroAI 2 port HDMI splitter distributes 1 HDMI input into 2 corresponding synchronized outputs. It's great for information distribution, conference room presentations, and school and corporate training environments. The HDMI Splitter functions both as a buffer and an amplifier. 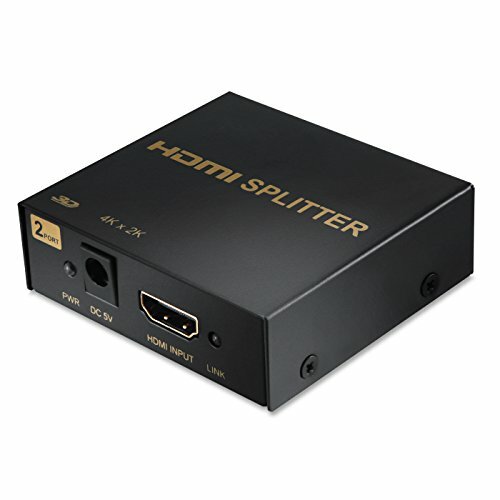 The series connection of this HDMI Splitter allows for long distance transmission of the HDMI signal up to 50 feet. Two or more HDMI Splitters can be cascaded to increase distribution significantly. The AstroAI HDMI splitter supports 4K and 3D up to 3840x2160 resolution; the advanced and strong chip can analyze and process up to 10.2 Gbps. An extra power adapter is included. -Suitable for: Xbox 360, Xbox One, Play station 3, Play station 4, Beamer, DVB receiver, TFT monitor, HD Ready or Full HD TV, Blu-Ray, DVD or HD-DVD player etc.